Nov. 29: The Tomcats vs Greenville for the Class 4A Championship - Kickoff @ 3:00PM. THIS GAME WILL BE RADIO BROADCAST ONLY. 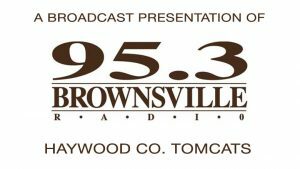 Visit www.brownsvilleradio.com and click "Listen Live" or tune your radio to 95.3FM to listen to the audio broadcast. The Tomcats vs Obion County (R) from Oct. 26 is the current video - Due to technical problems this is the last 49 minutes of the stream.